2001-03-15 Assigned to YARDNEY TECHNICAL PRODUCTS, INC. reassignment YARDNEY TECHNICAL PRODUCTS, INC. ASSIGNMENT OF ASSIGNORS INTEREST (SEE DOCUMENT FOR DETAILS). Assignors: EHRLICH, GRANT M.
2006-05-01 Assigned to UNITED STATES AIR FORCE reassignment UNITED STATES AIR FORCE CONFIRMATORY LICENSE (SEE DOCUMENT FOR DETAILS). Assignors: YARDNEY TECHNICAL PRODUCTS, INC.
2015-01-15 Assigned to ENER-TEK INTERNATIONAL, INC reassignment ENER-TEK INTERNATIONAL, INC DOCUMENTATION SHOWING ENER-TEK INTERNATIONAL, INC. IS PARENT COMPANY OF YARDNEY TECHNICAL PRODUCTS, INC. Assignors: YARDNEY TECHNICAL PRODUCTS INC.
An anhydrous inorganic gel-polymer electrolyte is prepared using a non-aqueous sol-gel process. The inorganic gel-polymer is prepared by reacting a metal halide (SiCl4) and an alcohol (tert-butyl alcohol) in a diluent solution containing a lithium salt (lithium bisperfluoroethanesulfonimide) and at least one carbonate. The resulting porous silicon oxide network encapsulates the liquid electrolyte. The gel polymer electrolyte can serve as both a separator and an electrolyte in a Li-ion cell. The material is stable and has demonstrated minimal flammability. Lithium-ion electrochemical cells made with the inorganic gel-polymer electrolyte function similarly to Li-ion cells made with a liquid electrolyte. The cells have low capacity fade, 0.69%, and low irreversible capacity, 7.6%. This invention was made with Government support under F29601-99-C-0100 awarded by the U.S. Air Force. The Government has certain rights in the invention. The electrolyte in commercially available lithium-ion electrochemical cells is typically a solution of a lithium salt, such as LiPF 6 or LiBF4, in a mixture of carbonate solvents, such as ethylene carbonate (EC), dimethyl carbonate (DMC), ethyl methyl carbonate (EMC) or propylene carbonate (PC). Although these liquid electrolytes are attractive as they offer good lithium ion conductivity (10−3 S/cm), they do present certain manufacturing and safety problems. These problems arise primarily from their low viscosity, which renders the electrolytes prone to leakage, and from the volatility and flammability of the organic components, which enable the electrolytes to readily burn and vent from the cells. In cells that utilize liquid electrolytes, a microporous separator film is used to electrically isolate the positive and negative electrodes. Since solid electrolyte materials do not leak and negate the requirement for a separator film, considerable cost savings are possible. Currently available alternatives to liquid electrolytes include ceramic, solid polymer and organic gel-polymer electrolytes. Examples of ceramic materials include lithium phosphorous oxynitride. This ceramic material conducts lithium and can act as a separator, eliminating the need for a microporous separator film. However, its low conductivity, typically 10 −7 S/cm, which is over 1000 times less than liquid electrolytes and manufacturing limitations, has inhibited further development and application of this material. Solid polymer materials, such as polyethyleneoxide (PEO), and variants such as polyphenolates, offer commercially viable processing properties, and the potential for cost savings, but they must operate at elevated temperature, normally about 40° C. to about 80° C., precluding their use in many applications. To obviate the low conductivity limitation of solid polymer materials, organic gel-polymer electrolytes have been developed. Gel-polymer materials are prepared by adding a solution of a lithium salt in an organic solvent to a solid organic polymer material. Materials using a variety of organic polymers, including (poly(vinylidene fluoride)-hexafluoropropylene (PVDF-HFP), poly(acrylonitrile) (PAN), poly(methylmethacrylate) (PMMA), poly(ethylene oxide) (PEO), poly(phosphazene) (PPz), poly(vinyl chloride) (PVC) and polytriethylene glycol(dimethacrylate) (PTGEGD), have been investigated and employed in electrochemical cells. The organic solvent and salt enable the material to offer conductivity near that of liquid electrolytes, while the polymeric matrix provides a solid structure in which the liquid electrolyte is immobilized or absorbed. While these materials mitigate leakage problems encountered with liquid materials, they do not offer any improvement in flammability and, despite considerable research and expense, they have eluded commercialization because of manufacturing, safety and scale-up problems. In the gel-polymer technology where PVDF-HFP is used as the polymer, after lamination of cell stack, a plasticizer, typically dibutylpthalate (DBP), is removed from the polymer before the electrolyte (such as EC:DMC, LiPF 6) is infused into the electrode stack. Some of the challenges associated with implementing this technology relate to scaling the extraction of DBP and infusion of the liquid electrolyte on a commercial scale. In an article entitled “Synthesis and Properties of Sol-Gel Derived Electrodes and Electrolyte Materials” by J Harreld et al. appearing in “The Proceedings of the 5th Workshop for Battery Exploratory Development”, published on Jun. 30, 1997, there is disclosed a solid electrolyte material which exhibits a high lithium-ion conductivity. The solid electrolyte was prepared by a known sol-gel process wherein a hydrolyzed silica precursor, namely, (tetramethyl) orthosilicate, Si(OCH 3)4, was admixed with a lithium ion conducting liquid electrolyte along with deionized water and an acid catalyst to form a lithium conductive sol. The liquid lithium electrolyte was prepared by dissolving ethylene carbonate with lithium borofluorate, LiBF4 in a propylene carbonate solvent to a molarity of 1.65M. After ageing and drying, Si—O—Si linkages form within the sol and a three-dimensional silicate network develops in which the liquid phase is encapsulated. The liquid electrolyte provides ionic conductivity while the silica linkages support the liquid electrolyte. Experimentation with the solid electrolyte material disclosed in the above article has shown that the lithium borofluorate, LiBF 4, component in the liquid electrolyte reacts with water in the reaction mixture and is not stable. This of course precludes use of this solid electrolyte material in the fabrication of a working electrochemical cell. A related material, using a water stable salt, was successfully demonstrated in a Li-ion cell as described in the above referred to co-pending application Ser. No. 09/137,492, filed on Aug. 21, 1998, the disclosure of which is incorporated herein by reference. These inorganic gel-polymer electrolytes are also based on the immobilization of a liquid electrolyte in an inorganic silica network. The conductivity of the dried gels is comparable to that of a liquid electrolyte, 3.5× 10 −3 S/cm at 25° C., (EC: PC, LiBF4) . At 80° C. the conductivity approached 10−2 S/cm. The sol-gel process used involved the hydrolysis of a silicon alkoxide (typically silicon tetraethoxysilane (TEOS), in an aqueous solution. Although the amount of water added was limited to that required for the hydrolysis reaction, residual water accelerated capacity fade when these electrolytes were used in Li-ion (LiCoO2/C) cells. All other characteristics of the cells evaluated were comparable to cells prepared with non-aqueous electrolytes. Prior efforts demonstrated that inorganic gel-polymer electrolytes of this type may be used in Li-ion cells, but to improve capacity fade the water must be eliminated. The preferred lithium salt for use in the inorganic gel-polymer electrolyte of the invention is lithium Bisperfluoroethanesulfonimide (LiN(SO 2C2F5)2). The metal halide used to prepare the anhydrous inorganic gel-polymer electrolyte of the invention is preferably silicon tetrachloride (SiCl 4) but halides of other metals such as aluminum, titanium, vanadium, chromium, molybdenum, and tungsten may also be useful in the sol-gel process. The electrochemical cell according to the invention may employ any conventional anode material but preferably the anode is carbon. Other anode materials that may be used include lithium, titanium oxide, tin oxide, tin or germanium oxide, for example. Similarly, the cathode material may be any conventional cathode material but preferably is a lithiated transition metal oxide such as lithium cobalt oxide LiCoO 2. Other suitable cathode materials include LiNiO2, LiNi0.82Co0.18O2 and LiMn2O4, for example. FIG. 5 is a curve showing the discharge capacity vs. cycle number for a Al/LiCoO 2/inorganic gel polymer on separator/Li//Ni cell cycled at 0.2 mA/cm2 on charge and discharge at 25° C.
FIG. 12 is a curve showing discharge capacity vs. cycle number for a Li-ion cell employing Al/LiCoO 2/PVDF-HFP//inorganic gel-polymer/MCMB carbon//Ni cycled at 0.25 mA/cm2 between 3.0V and 4.0V and in which the edges of the electrodes were electrically isolated by an insulating gasket. A liquid electrolyte solution was used as the diluent in the polymerization reaction. To form the liquid electrolyte solution, lithium bisperfluoroethanesulfonimide salt (LiN(SO 2C2F3)2, 3.004 g, 7.76 mmol) was dissolved in 7.76 mL of a 1:3 (v/v) EC:EMC solution. Next, tert-butanol (t-BuOH, 1.6 mL, 17.5 mmol), diluted in 3.33 mL of liquid electrolyte, was added to a vial containing silica tetrachloride (SiCl4, 0.573 mL, 5 mmol), and 4.43 mL of liquid electrolyte. The mixture was gently stirred for five minutes and then coated onto negative electrode material by dipping the electrode into the unpolymerized mixture. The coated electrode was then heated to 100° C. After the coated electrode appeared dry by eye, typically 10-15 minutes, the coating process was repeated by dipping the negative electrode into the inorganic gel-polymer solution and heating. Typically, five (5) coats of inorganic gel-polymer were applied. In some cases, a glass fiber separator was coated instead of the negative electrode material; the same procedure was followed. Complete polymerization of the bulk material occurred within three hours of mixing. The product of this synthesis is a SiO 2 network that immobilizes a solution of a lithium salt in a carbonate solvent. A possible reaction scheme for this non-aqueous sol-gel process is shown below. As seen above, the polymerization is initiated by a nucleophilic substitution of the Cl atom in silicon tetrachloride by the oxygen in the tert-butanol. The resulting compound, SiCl 3OR, can then nucleophilically substitute a Cl atom on another SiCl4 molecule. 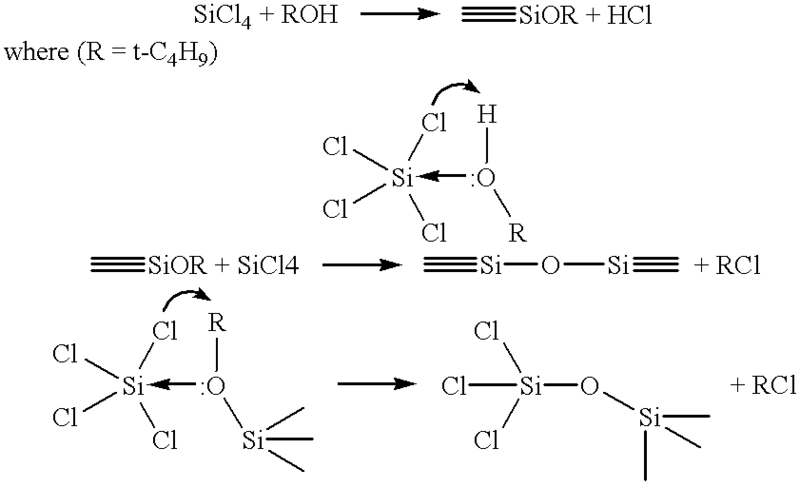 This reaction repeats until there is a Si—O network. The optimal stoichiometric ratio of SiCl 4 to t-BuOH and the concentration of the reagents in the diluent solvent was also investigated. It was found that if 1M SiCl4 and 3.5M BETI is used in the stoichiometric ratio of 1:3.5 to 1:4, high quality, homogeneous gels are formed in 3 hours. Use of concentrated solutions of SiCl4 and t-BuOH result in a highly exothermic reaction and an anhydrous solid inorganic polymer. Lower concentrations of reactants generally yielded softer gels with a longer cure time. Three different salts, LiPF 6, LiBF4 and BETI were used in this synthesis. The salts LiPF6 and LiBF4 precipitated out of solution during the polymerization reaction; however, BETI remained in solution throughout the process. One of the limitations of this polymerization reaction is the production of HCl gas. Electrodes containing cobalt and copper reacted with the hydrochloric acid. The positive electrode material, LiCoO 2 on Al, and a negative electrode material, graphite on Cu, were observed to degrade when coated with the inorganic gel-polymer electrolyte. However, the negative electrode material, graphite on nickel, was observed to be compatible with the inorganic gel-polymer electrolyte. Further it was found that heating the coated graphite on nickel electrode removed the HCl from the material. Therefore, this type of electrode was used in the cells described below. Voltammetry was used to demonstrate that the inorganic gel-polymer electrolyte was stable over the range of potential required for lithium-ion cells, 0V to 4.5V vs. Li. To evaluate the stability of the polymer at high potentials (3V to 5V vs. Li) a blocking electrode cell was used. This cell incorporated an aluminum positive electrode, the inorganic gel-polymer coated on glass fiber paper, and a lithium negative electrode. The stability of the material at high potential is illustrated in the voltammogram shown in FIG. 1. Below 4.5V the current density is small, less than 6.5×10 −4 mA/cm2, demonstrating the stability of the materials and the minimal amount of cell corrosion or electrolyte degradation present. To illustrate the chemical compatibility of the inorganic gel-polymer electrolyte with LiCoO 2 in an electrochemical cell, a cell was fabricated where the positive electrode was LiCoO2, the negative electrode was lithium, and the inorganic gel-polymer was immobilized within glass fiber sheet that separated the positive and negative electrodes. The cell was cycled between 3.0V and 4.25V vs. Li at 0.2 mA/cm2. A plot of the cell voltage vs. time is shown in FIG. 3. These charge and discharge curves illustrate that the cell could be repeatably charged and discharged without significant degradation, thus the cell components, including the inorganic gel-polymer electrolyte, are stable in these conditions. As illustrated in FIG. 4, a plot of dQ/dV versus voltage for the first cycle, the cell potential is characteristic for a LiCoO2/Li cell and the charge/discharge process is highly reversible. A voltage plateau occurs at 3.96V vs. Li on charge and 3.87V vs. Li on discharge. Additionally, as illustrated in FIG. 5, these materials have demonstrated low capacity fade, 0.69% per cycle over 14 cycles. To further demonstrate the viability of the inorganic gel-polymer electrolyte of the invention, a cell was fabricated incorporating a LiCoO 2 positive electrode, a MCMB 25-28 carbon negative electrode and a microporous polyethylene separator on which the inorganic polymer electrolyte was immobilized. The cell was cycled between 3.0 and 4.25V at 0.25 mA/cm2. FIG. 8 shows the cell voltage over eight cycles, indicating that the inorganic gel-polymer electrolyte is chemically compatible with electrode materials, carbon and LiCoO2. The irreversible capacity on the first cycle for this cell was 0.462 mAh or 14.6%, comparable to that typical for Li-ion cells. A plot of discharge capacity over 7 cycles is shown in FIG. 9. As shown, the discharge capacity dropped from 2.698 mAh to 2.575 mAh over the seven cycles, thus a fade rate of 0.65% per cycle. An attractive feature of the inorganic gel-polymer electrolyte is that it can be coated onto the negative electrode material used in Li-ion cells. This feature is expected to enable the manufacture of lower cost Li-ion cells. To demonstrate the ability of electrodes coated with the inorganic gel-polymer to reversibly incorporate lithium, coated negative electrodes were cycled versus lithium in a (Ni//mesocarbon micro-beads (hereinafter MCMB)/inorganic gel-polymer//PVDF-HFP//polyethylene/Li) cell between 1V and 0V at 0.1 mA/cm 2. As illustrated in FIG. 8, the coated negative electrode intercalated and deintercalated lithium at potentials typical for carbon and desirable for Li-ion cells; the irreversible capacity was 7.6%. To demonstrate the viability of a MCMB electrode coated with the inorganic gel-polymer material in a Li-ion cell, a (Al//LiCoO 2/PVDF-HFP//polyethylene//Inorganic gel-polymer coated on MCMB Carbon//Ni) cell was fabricated. The cell was cycled between 3V and 4.1V at 0.1 mA/cm2 as shown in FIG. 11 for 13 cycles. As shown, the potential and capacity of the cell were stable. Over the thirteen cycles shown in FIG. 10, the capacity fade rate was 0.35% per cycle, thus it can be concluded that the negative electrode coated with the inorganic gel-polymer functions in the same manner as a non-coated negative electrode. In the cells described above, a microporous polyethylene film or glass fiber separator were incorporated into the cell to serve as an electrical separator between the positive and negative electrodes. To demonstrate the ability of the inorganic gel-polymer material to serve as both the electrolyte and separator in a cell, a cell was constructed in which only the inorganic gel-polymer material, coated onto the negative electrode, separated the positive and negative electrodes of the cell. In this cell, (Al//LiCoO 2/PVDF-HFP//Tefzel® gasket/inorganic gel-polymer/MCMB//Ni), a Tefzel® gasket or doughnut was used to insulate the edges of the negative electrode from the positive cell cover. Due to edge effects, the polymer coating was thinner and less consistent around the perimeter of the negative electrode. The voltage of the cell, which was cycled at a rate of 0.25 mA/cm2 between 3.0V and 4.0V, is shown in FIG. 11. As illustrated, the cell capacity and voltage were stable as it was charged and discharged seventeen times. The irreversible capacity for the first cycle is 33%. As shown in FIG. 12, the capacity of the cell increased as it was cycled. 1. An electrolyte for an electrochemical cell comprising: an anhydrous gel-polymer composed of a three-dimensional inorganic metal oxide network encapsulating a liquid electrolyte solution containing a salt and an organic solvent. , wherein the inorganic network is composed of an oxide of a metal selected from the group consisting of aluminum, silicon, titanium vanadium, chromium, molybdenum and tungsten. , wherein the inorganic network is composed of silica. , wherein the salt is an alkali metal or alkaline earth metal salt which is stable in the presence of water. , wherein the salt is an organic lithium salt selected from the group consisting of lithium bisperfluoroethanesulfonimide, lithium bis[5-fluoro-2-olato-1-benzenesulfonato(2-)-O,O]borate(1-), lithium bis-(trifluoromethanesulfonyl)imide, lithium tris-(trifluoromethanesulfonyl)-methide, and lithium bis-(trifluoromethylsulfonyl)methane. , wherein the salt is lithium bisperfluoroethanesulfonimide. , wherein the organic carbonate is selected from the group consisting of ethylene carbonate, dimethyl carbonate, diethylcarbonate, ethyl methyl carbonate, methyl propylcarbonate and dimethylether and mixtures thereof. 8. An electrochemical cell comprising an anode, a cathode and an electrolyte disposed therebetween, said electrolyte comprising an anhydrous gel-polymer composed of a three-dimensional inorganic metal oxide network encapsulating a liquid electrolyte solution. , wherein the anode is composed of carbon. , wherein the cathode is composed of a lithiated transition metal oxide. , wherein the cathode is composed of LiCoO2. allowing said liquid percursor to solidify in situ forming a gel-polymer electrolyte between said anode and said cathode. , wherein the metal halide is silicon tetrachloride. , wherein the alcohol is tert-butyl alcohol. , wherein the anode is selected from the group consisting of carbon, lithium titanium oxide, tin oxide, tin and germanium oxide and the cathode is selected from the group consisting of LiCoO2, LiNiO2, LiNi0.82Co0.18O2 and LiMn2O4. lithium bisperfluoroethanesulfonimide, lithium bis[5-fluoro-2-olato-1-benzenesulfonato(2-)-O,O]borate(1-), lithium bis-(trifluoromethanesulfonyl)imide, lithium tris-(trifluoromethanesulfonyl)-methide, and lithium bis-(trifluoromethylsulfonyl)methane. , wherein the solvent is selected from the group consisting of ethylene carbonate, dimethylcarbonate and mixtures thereof.